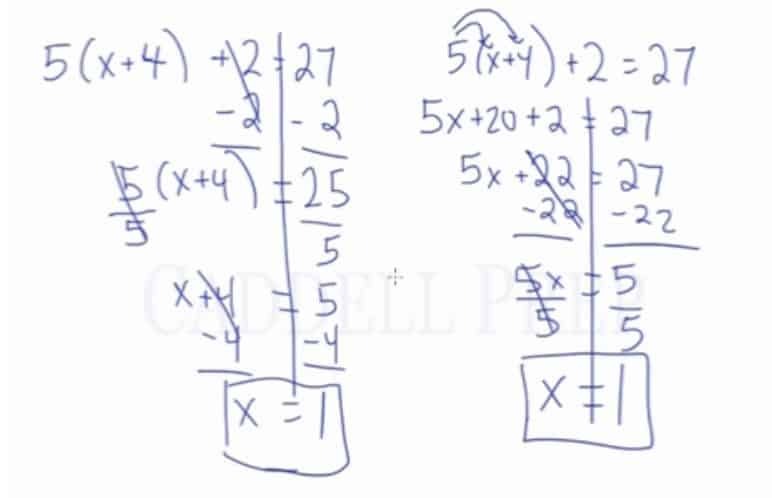 In this video, we will be learning how to solve for x (or another variable) in complex algebraic equations using inverse operations. Let’s get into solving complex algebraic equations. This involves more than one operation. To review, order of operations or PEMDAS, we have . In solving algebraic equations, we don’t have all whole numbers. Instead, we have variables in it. So, we may have . From our example, we already know that . But let’s try solving this algebraically. We just have to do few steps to solve this. 1. Simplify both sides of the equations, if possible. 2. If there’s terms on both sides, we have to get all the terms on one side. You can have it on the left side or on the right side, whichever you prefer. 3. Reverse PEMDAS. We’re going to do the order of operations backward using inverse operations. 4. Our goal is to isolate the variable . Going back to , let’s do the steps above. 1. Simplify – This is the simplest it can get. 2. All term on one side – There’s just one and it’s on the left. 3. 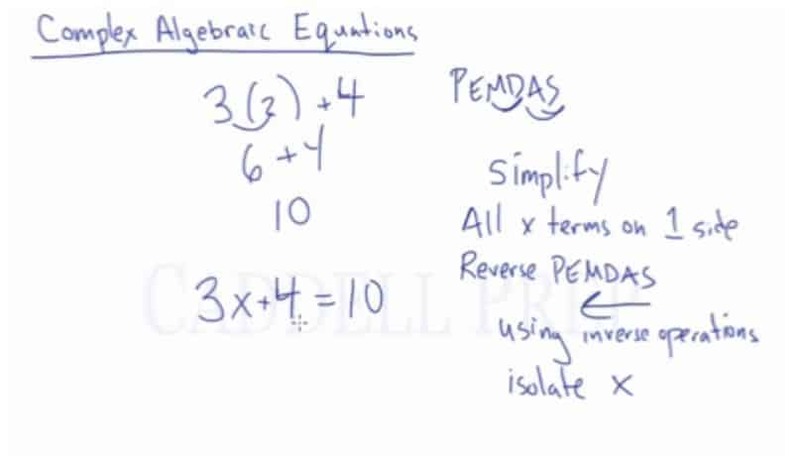 Now, let’s do the reverse PEMDAS using inverse operations. Let’s subtract on both sides of the equation. Here we have to divide both sides by . So, let’s start off by adding on both sides of the equation. Then, we multiply on both sides. Let’s have one more example. I’ll show you how to solve this using two different ways. So now let’s move on to the second method of solving the same equation. The second method is to simplify the equation as much as we can. Then we have to do the reverse PEMDAS. Now, let’s do the inverse of multiplication which is division. Both methods gave us the same answer . To sum up, no matter how complex our algebraic equation is, we can do reverse PEMDAS or inverse order of operations to isolate the .